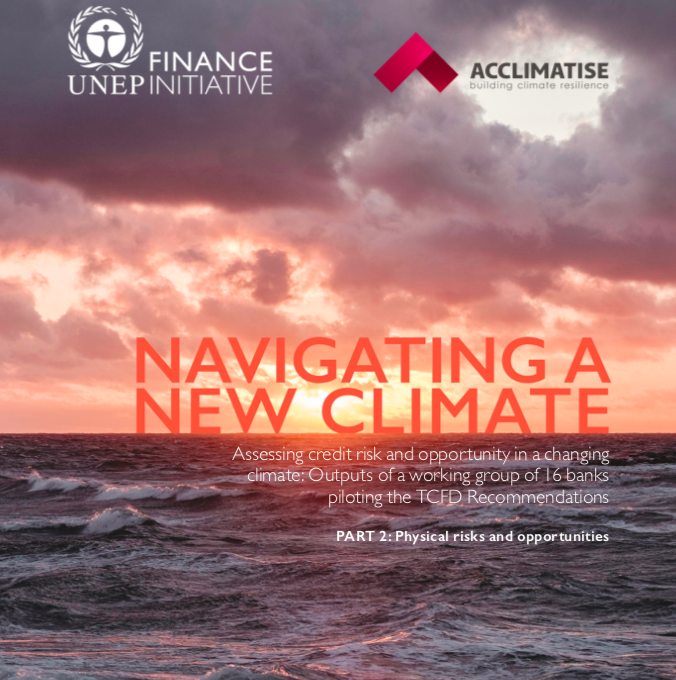 The physical risks from a changing climate may differentially affect the financial health of businesses and impact the financial performance of sectors, creating risks and opportunities for those financing or investing in them. This report* is the result of a collaboration of sixteen of the world’s leading banks coordinated by the UN Environment Finance Initiative (UNEP FI) Secretariat to advance recommendations published by the Financial Stability Board’s Task Force on Climate-related Financial Disclosures (TCFD). The TCFD recommendations urge banks to use scenario analysis to disclose the “actual and potential impacts” of climate-related risk and opportunities for their business as well as how they identify, assess and manage climate risks. This report describes a pilot project that aimed to develop climate change scenarios and methodologies that can be used in-house by banking teams. It focuses on physical risk, which is the risk resulting from climate variability, extreme events and longer-term shifts in climate patterns. As a pilot exercise, the output of this process is intended to provide a first, but critical step, in a longer process of responding to the TCFD recommendations. During the pilot project, each bank in the Working Group co-developed and trialed at least one of the physical risk methodologies. The results, findings and lessons learned from these case studies are presented in Chapter 3. This report constitutes the second in a two-part series publishing both the physical risk and transition risk assessment methodologies developed through the Working Group’s collaboration. The first report in the series ‘Extending our horizons: Assessing credit risk and opportunity in a changing climate’ was published in April 2018. The pilot project selected climate-sensitive sectors: agriculture, energy and real estate. The methodologies developed in the pilot project reflect the differences in these sector's vulnerability to the physical impacts of climate change. The methodology for agriculture and energy focused on analyzing the impacts of incremental climate change and extreme events on borrower revenues and cost of goods sold, and estimating changes in probability of default. For real estate, the methodology assessed potential changes in property values and loan-to-value ratios due to extreme weather events. Overview of the pysical risk methodologies (figure 0.1, page 9). Three combinations of timeframes and temperature scenarios were considered: 2020s – 2°C and 4°C; 2040s – 2°C; and 2040s – 4°C. Peer-reviewed assessments based on these scenarios were used to provide data on incremental climate change impacts on sub-sector performance, such as agricultural yields, crop prices and power production. These were then used to estimate changes in revenue for borrowers in these sectors. A range of extreme weather and climate events were assessed. Impacts on property value, production and revenue losses, and increases in costs were assessed using global and regional datasets on observed frequencies of tropical cyclones, flood, wildfire, drought and extreme heat. Estimates of the change in revenue, costs and property value were used to evaluate changes in credit risk for individual borrowers and sector portfolios. For borrowers in the agriculture and energy sectors, the financial ratios in rating models which have revenue and cost components were stressed, and revised risk ratings were calculated. For real estate borrowers, estimates of changes in property value due to extreme weather events were used to calculate changes in loan-to-value ratios. The physical risks from a changing climate may differentially affect the financial health of businesses and impact the financial performance of sectors, creating risks and opportunities for those financing or investing in them. To date, risks and opportunities resulting from the physical impacts of climate change have received attention within the insurance sector, but have not been widely assessed in credit and lending portfolios held by banks. Greater emphasis appears to have been placed on transition-related risks and opportunities resulting from the shift to a low-carbon economy. Banks can begin to assess physical climate risks in their loan portfolios for climate-sensitive sectors using climate change scenarios and methodologies which evaluate impacts on key credit risk metrics. The methodologies presented in this report describe some of the impacts of climate change scenarios on borrowers’ revenues, costs and property values, and estimate how these changes could affect the Probability of Default (PD) and Loan-to-Value (LTV) ratios at a borrower and portfolio level. Assessments of the physical risk of climate change need to consider the impact of both incremental shifts in climate conditions and changes in extreme events. Incremental changes in climate (such as rising temperatures and changes in precipitation patterns) can affect economic output and productivity, while extreme events can lead to damage, operational downtime and lost production for fixed assets, and potential changes to property value. Extreme events, which are increasing in both frequency and intensity, often attract more attention as their impacts are more apparent. However, the risks from incremental changes, which are already underway, should not be overlooked. Extreme events may only occur in specific locations (such as floodplains or tropical cyclone regions) and require banks to have the ability to assess the probability of their borrowers being impacted by these events. In contrast, incremental changes have the potential to gradually erode the financial performance of entire borrower segments. Banks can also begin to evaluate the growing opportunities to support borrowers’ finance requirements in adaptation. The Working Group has developed a framework for banks to assess strategic opportunities created by the need for borrowers to implement climate adaptation measures (see Chapter 4). The methodologies developed in the pilot project can be applied to a wide range of sectors. The methodology piloted for the agriculture and energy sectors could be used to assess changes in credit risk across other sectors, provided that research exists to link changes in climate parameters with production characteristics of the sectors. This pilot project represents a first step in the development of methodologies, but further work is needed to improve the ability to assess physical risks and opportunities of climate change. The pilot project has identified the need to: access location-based borrower data, improve climate models and datasets that can be applied to assets and industries, integrate the macro-economic impacts of climate change, determine adaptation finance needs, and better understand the evolution of insurance products, premiums and markets. A taxonomy of climate-related opportunities has been created (see Chapter 4). The taxonomy recognises that some of the effects of a changing climate are already occurring, and financial products and services can help borrowers undertake actions to manage existing risks, such as extreme event preparation and post-event recovery. Building climate resilience is a journey; the pilot project has broken new ground, but more work lies ahead. The results of the pilot project highlight several factors potentially affecting the financial performance of borrowers which cannot be properly assessed at present, including macro-economic impacts, adaptation finance needs, and future actions of governments and insurers. As a result, the assessments of climate impacts on borrowers may be incomplete. Filling these gaps will improve the robustness of future assessments. Communication and collaboration between banks and stakeholder groups is needed to take this forward effectively. Improved collaboration with the climate and economic research community can help to strengthen the evidence base underpinning physical risk assessments. Key areas for development are improved spatial data on future changes in extreme weather and climate events, and further research on the macro-economic impacts of physical climate risks. At present, macro-economic modelling approaches provide a wide range of estimated impacts on gross domestic product (GDP). Furthermore, there is very little research on how physical climate change will affect broader macro-economic indicators such as inflation and interest rates. Improved tools and spatial modelling expertise on the physical impacts of climate change are needed for banks to better quantify physical risks and opportunities. Analytical tools are beginning to emerge which facilitate banks’ assessments, such as spatial risk analysis platforms, although there are challenges with how these platforms interact with borrower data. Platforms should be developed and improved to incorporate analytics for evaluating physical risks in borrower’s value chains. Improved collaboration between banks, borrowers, governments and the insurance industry would increase the quality of forward-looking disclosures. Improved disclosures by businesses across all sectors will aid banks in evaluating the risks in their loan portfolios, and will also help banks to identify opportunities to support their borrowers. Governments provide essential risk mitigation measures against extreme events and incremental climate change impacts, including flood defences, climate-related standards for critical infrastructure such as water resources and energy, and financial backing of insurance schemes. Government policy and regulation on adaptation in these areas can have a profound impact on banks’ borrowers. The insurance industry has been vocal about climate change for decades; however, it is unclear how insurance availability and pricing will change in the future, as a result of the impact of climate change. Figure 3.7 from page 41 of the report: Overlay – Exposure of global power plants to present-day 1:100 year extreme heat risk (Exposure of Physical Assets to Climate Risks). This is an output of the approach developed by TD Bank Group (TD), Bloomberg and Acclimatise to use geospatial solution for assessing physical risks of climate change on borrower credit ratings within a bank's lending portfolio (see page 38 of the full report). Connell, R., et al., 2018. Navigating a new climae. Assessing credit risk and opportunity in a changing climate: Outputs of a working group of 16 banks piloting the TCFD Recommendations. United Nations Environment Programme.